There’s something very serene about the combination of birds, particularly swans, and water. Sometimes, waterfowl can be aggressive towards each other birds, or squabble about food, but, generally speaking, they move gently but purposefully, and I find looking at them very calming. I was brought up in the country and trees, water, birds and wildlife generally is something I miss. 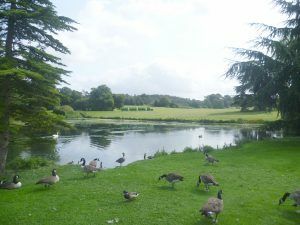 I was thinking about this last week when I visited Leeds Castle in Kent. 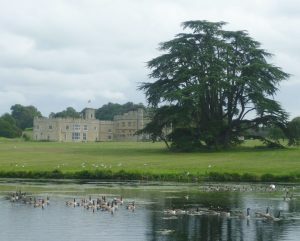 The castle itself is built on an island in the River Len and surrounded by a wide moat which is almost a lake and next to Great Water, another lake. The walk there, through woods by the river and passing yet more ponds and lakes, means there is plenty of room for waterfowl. I loved the contrast between the dramatic black swan and the other white swans, whilst smaller mallard and the occasional coot provided the supporting cast. I’d had a tiring week and, as I watched them, I could feel the tension leaching out of me. I could stop and admire them; I didn’t have to rush. I stopped again by the cascade garden and walked to the middle of a scarlet, vaguely Chinese-looking bridge which faced a cascade at the end of a large pond, where another swan was majestically sailing. Nearby on the low stone edging, a cormorant stood awkwardly, its neck stuck out at an angle. 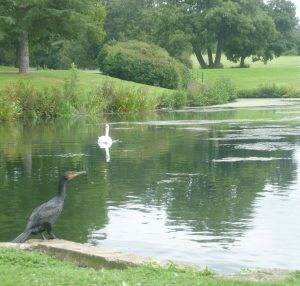 As the white swan floated past, the cormorant slipped into the water and followed, looking ungainly, almost as if it was half-submerged. In the distance, you can just see the small green train on the left crossing the green on the far side of the lake which takes visitors straight to the castle. I preferred to walk through the woods but it’s a couple of miles and there’s no doubt the train is quicker, besides giving the visitor a ringside view of the castle itself. It was all very good for the soul. Oh, that sounds SUCH food for the soul. I love water and waterfowl. It is wonderful, Jan, isn’t it? 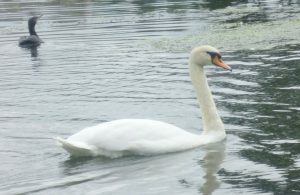 I love garden birds, too, chaffinches etc., but there’s something special about a beautiful swan floating on water! And I always enjoy watching ducks upending themselves to find food underwater; they make me smile. I used to watch a mating pair of geese with their gosling, along with ducks and ducklings on a pond as I walked to work and back. The tragedy was the blasted rats. Every day there were fewer ducklings and it broke my heart. No swans, sadly. That’s so sad, Elizabeth. 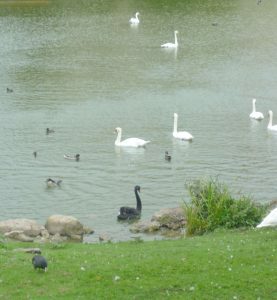 There are various swans and ducks etc. on my local stretch of canal and they have safe havens to nest on which predators can’t reach. Mind you, I think the swans could probably see off most predators. They can be pretty fierce!